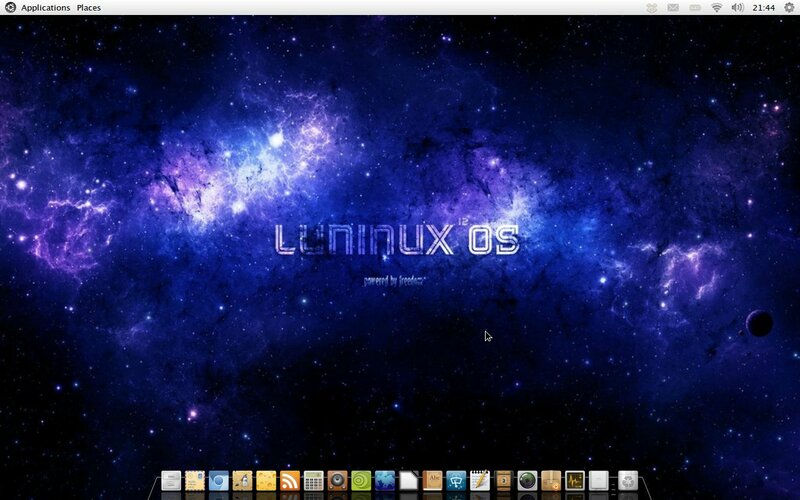 Luninux is based on Ubuntu so the installation for Luninux is very familiar. Simply download the ISO from the Luninux website and burn it to a USB drive using Unetbootin or to a DVD. 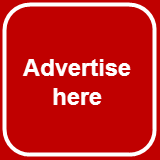 Alternatively you can order a DVD from the download page. Once you have a USB drive or DVD boot into Luninux and click the install icon. The rest of the installation is the same as it is for Ubuntu. Simply choose whether to use the whole drive or to install alongside an existing operating system and then choose your location and the username and password you wish to use to log in to Luninux. 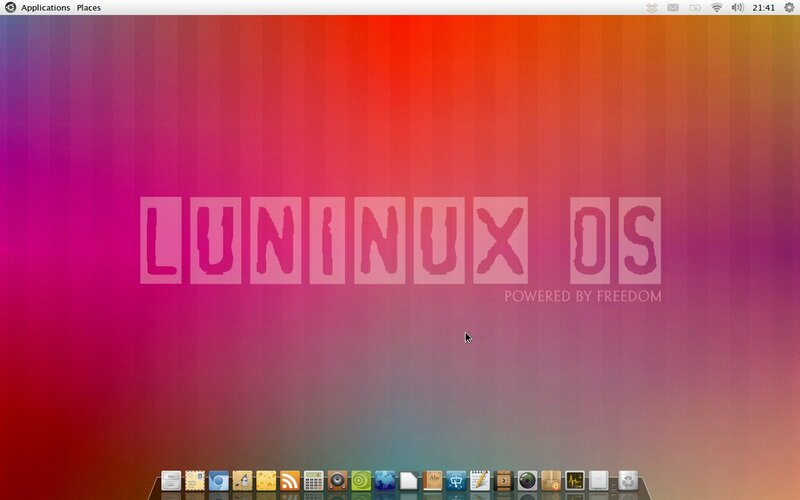 Luninux operating system loads into a bright red desktop with the Luninux logo written across the centre. At the top is the standard Gnome taskbar and at the bottom the docky docking bar. If you don’t like the desktop wallpaper you can change it by clicking the spinner icon in the top right hand corner and select "Settings". Then select "Appearance". There are a number of desktop wallpapers available including the one shown below which is the one I liked the most. The taskbar at the top has two menus on the left and on the right there are a series of icons including a battery icon, wireless network icon, audio icon, a clock and the spinner icon which pulls up a menu enabling you to shut down and change system settings. The menus on the left make it so easy to navigate Luninux with Applications providing a drop down list of categories containing applications and Places providing access to all your drives and folders. The dock at the bottom of the screen makes it even easier to launch the most commonly used applications by simply clicking on the icons that represent them. If you prefer the more modern Gnome 3 shell desktop then you can set this as your default desktop by logging out and changing the desktop environment for your user. As Luninux is based on Ubuntu connecting to the internet is really easy. Clicking the wireless icon in the top right hand corner showed me both my home broadband and mobile broadband networks. I clicked on the mobile broadband connection and entered the key and I was connected within seconds. Luninux comes preinstalled with the Chromium browser which as I have expressed before is my preferred browser anyway. Luninux comes preinstalled with the ability to play Flash and MP3 files. 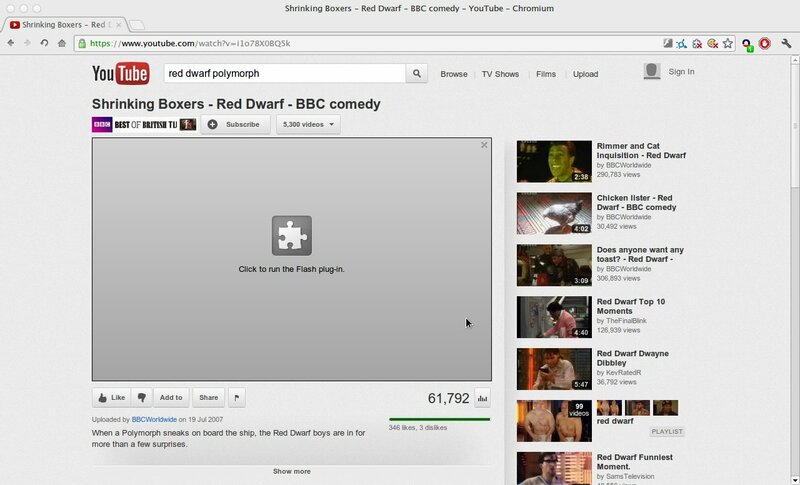 I tested flash out by going to Youtube and then I performed a search for a Red Dwarf video and the following screen appeared. The image of the jigsaw piece is confusing, but there is nothing to worry about,because clicking on the image starts the video playing as shown below. The next test was to play some music. Now my preferred music player is Rhythmbox but Luninux has GMusicBrowser installed. I loaded GMusicBrowser and it was able to play my MP3 files without any issues. Luninux comes with a few other neat little tools. 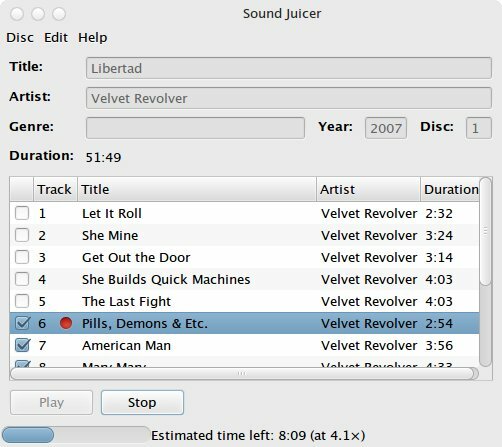 Firstly if you insert a CD you can extract the CD to a number of different file formats including OGG Vorbis by using the application "Sound Juicer Audio Extractor". Simply select all your files and click "Extract" to extract the files. To choose the file format select "Edit" and then "Preferences". You can then choose to extract to OGG, MP3 and FLAC. Before making this choice it is worth considering the file formats supported by any external audio player you might be using. I chose to extract to OGG and then I used the GMusicBrowser to load and play the files I had extracted. GMusicBrowser is quite a decent tool if you just want to create playlists and listen to your music. 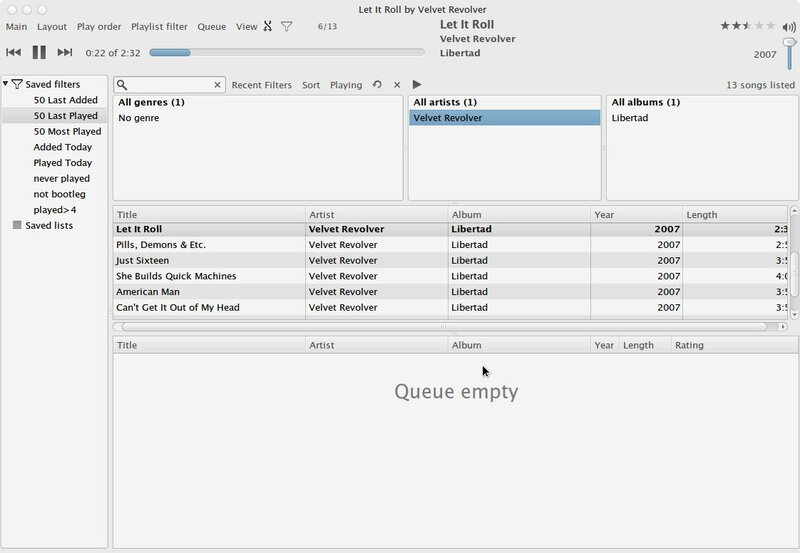 It isn't however linked to a music store and it cannot synchronise to external audio players so it isn't a rival for more accomplished music players such as Rhythmbox, Banshee and Amarok. Luninux comes packed with a decent amount of applications. Under the accessories section there are the usual suspects including gEdit (Text Editing), Archive (zipping tool), Calculator, File Manager, Screenshot and Terminal. There are only three games, two of which are the card games "Aisleriot" and "Freecell" and the other is gBrainy, which is a series of logic and maths puzzles. There is also "PlayOnLinux" which enables you to play Windows games within Luninux. The graphics section comes with LibreOffice Draw, GIMP, Image Viewer, Shotwell photo manager and Pinta Image Editor (a bit like MS Paint). The Internet section has the desktop sharing tool, Chromium web browser, Dropbox Client, RSS Reader, XChat IRC Client, Messaging software and the Transmission BitTorrent Client. The Office section is taken up by LibreOffice applications. There is a science section with a tool called "Basic 256" which is a basic programming environment aimed at children. Under the Sound and Video section there are the music tools mentioned earlier "Sound Juicer" and "GMusicBrowser" as well as the Totem Movie Player, Record My Desktop, Brasero for burning CDs/DVDs and the XBMC media center. There is the usual array of system tools which enable you to configure your system, perform backups and install software. Finally WINE is installed for running Windows software within Luninux. To install software you can use the Ubuntu Software Center which is at the bottom of the Applications menu. After running the software center you can enter the type of software you want in the find box and a list of potential applications will appear. The only issue that I have found thus far is that the XBMC media center pulls up the following error. I managed to fix this error by reinstalling XBMC. My first impressions of Luninux is that it is clean, user friendly and comes with a fairly complete set of applications. I’m not sure whether the applications listing the purpose of the application as opposed to the name of the application is a good thing or not. For example I have used GIMP for years and so I looked through the menu for GIMP but it is listed as Image Editor. For people new to Linux and those that may not have heard of GIMP it might be nice to see it as Image Editor. Is the Freedom message a little blurred as well? Reading the about page on the Luninux web page highlights the spirit of freedom. The tag line for Luninux is "Powered By Freedom". What does that mean exactly? 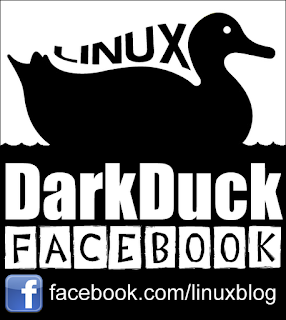 How does Luninux differ from other Ubuntu distributions in this respect? Is it driven by free applications? If this is the case then the selection of applications is good including Chromium and GIMP and there has to be a reason why GMusicBrowser was chosen over Rhythmbox and Banshee yet WINE is made available which suggests running proprietary Windows applications. From a users perspective if you have an older PC or like Gnome the way it used to be then Luninux could be just what you are looking for. I do have concerns with Luninux that the same can be achieved by installing Xubuntu or Lubuntu and I'm not sure where the gap in the market is for Luninux. There is nothing really wrong with Luninux, it loads in a timely fashion and with the exception of XBMC the applications all seem to work correctly. I'd like to thank Dmitry for accepting this guest post. If you like this review then I also write my own blog at www.everydaylinuxuser.com. Exelent distro,in my pc work in dual boot,win 10 - Luninux...Good distro,working perfect...Recomanded for try !